South East Asia is famous for its crowded streets, speeding mopeds, buses, and trains that never go on time and ever-present chaos in public transport. Thailand is a bit more developed than the other nearby countries, but when it comes to its transportation it’s not that much different. It’s easy to get lost here. When I first visited Thailand I was in shock. Nothing was the same as in Europe and it wasn’t easy to get used to scooters and the public transport, which wasn’t very reliable. I could have avoided any surprises if I had prepared myself for the trip a bit better. Fortunately, today I know and I would like to share this knowledge with you. 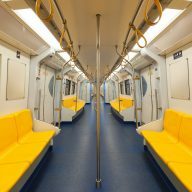 In this post, I will give basic information regarding public transport in Thailand, which will make it easier for you to move around the Kingdom. However, always be prepared for surprises. This is Thailand after all and you never know what might happen. 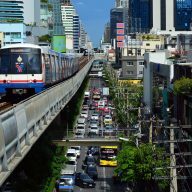 Transport in Thailand – what to expect? Transport in Thailand is more developed than in Cambodia or in Vietnam. People are a little bit more cultured and don’t push you around, don’t jump queues and are polite to one another. In bigger cities, it’s quite easy to catch a cab. 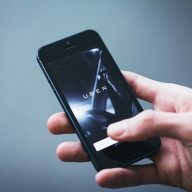 Uber and Grab are great here and their prices are very competitive. It’s easy to travel between the larger transportation hubs. As it’s a very touristy country, you won’t have much trouble to get to the central spots. It might take you a while to get used to the way things work here, but don’t give up. When you understand the system, it will be hard to stop you from travelling to different places in the country. 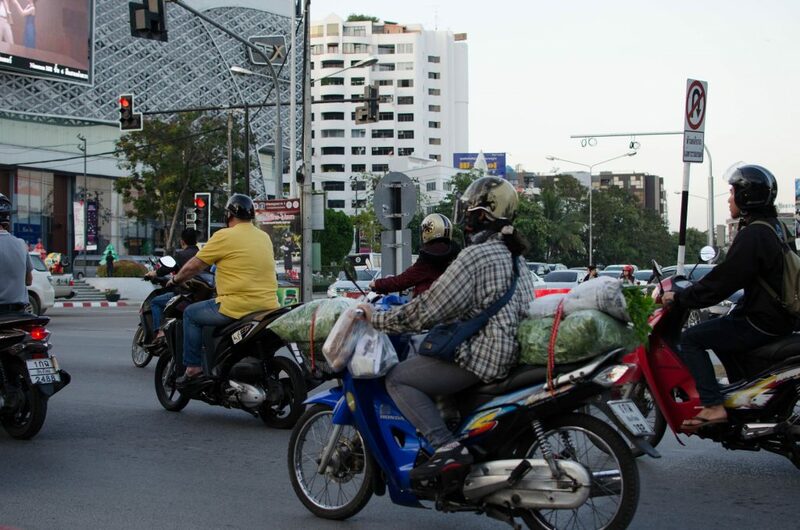 Many cities in Thailand don’t have a very developed transportation system. In most cases, you have to rely on taxis and songteaws – big trucks, where you sit at the back. Everything depends on where you’re going. It’s worth reading about each place to avoid confusion and stress. Below you will find transportation types at each larger locations in Thailand. Bangkok is not a laid-back city and despite the fact that Thais are very chilled, streets here are far from being quiet. Transport in Bangkok is quite developed and you can easily understand how it works after a few days of being here. Probably the best way of moving around the city. BTS trains are fast, clean and comfortable. Skytrain has 2 lines – Sukumvit, which stretches from the north to the east and Silom, which runs from the south to the west. The trains work from 6:30 until midnight. If you want to use BTS more often, it’s good to buy a BTS Smart Card. Temporary residents and tourists can purchase a Rabbit Card. Another option is to simply buy a single ticket, which are available at the stations. Ticket machines accept only small change. If you don’t have any coins, you can break your notes at a cash desk, which is usually located just next to the machines. One way ticket costs 20-60 Baht. A whole day ticket costs 120 Baht. Monthly tickets are also available and cost 300-1,000 Baht, depending on the number of stops. Metro in Bangkok is also fast and modern. It includes 18 stations and covers 20 km from Hua Lamphong in the south to Bang Sue in the north. Trains leave every 5-7 minutes and start running at 6:30. They finish at around midnight. Tickets are small tokens, which you can buy at the stations. Streets of Bangkok are crowded with buses. They are usually very old and seem to be struggling with the number of people and heat. There are so many lines and kinds of buses in Bangkok that it’s hard to get your head around it. If you really want to use them, then it’s good to get an MBTA map, which is available at bus terminals. Buses in Bangkok start running at 5 am and finish at midnight. The cost varies depending on the kind of a bus you choose. 8.50 Baht is an express bus and 9-19 bus costs to get on a bus with an air con. Except that there are: a red line (8 Baht), a white and blue line (8 Baht) and an orange line (2-22 Baht). Tickets are available from a person on the bus, who should approach you as soon as you take a seat. They will ask you where you want to go and based on that information will sell you a ticket. Make sure you have some change with you. If you want to get off, you need to let the driver know. You can do that by pressing a special button, which is located above the seats. Just remember to do it before you get to your stop. 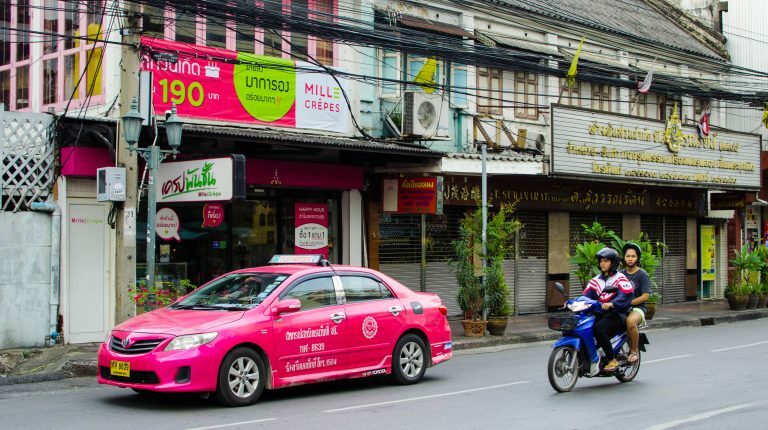 Taxis in Bangkok have their charm, but they are quite disliked by tourists. They look interesting and colourful, but drivers like to cheat and raise their prices. They are not very keen to use meters and don’t want to pick up people, who will bargain with them. If you don’t want to overpay then learn some Thai. Asking for a price in the local language might be very helpful in some situations. You can catch a taxi on the street. Cars with a special red light on on the driver’s side are free. You just have to wave at it for the driver to stop. 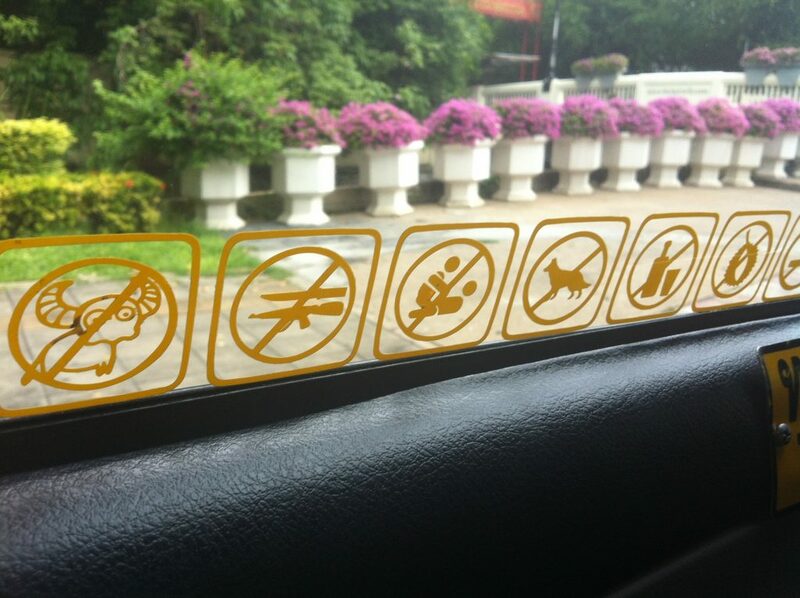 Famous stickers, which you can see in taxis in Bangkok. Uber and Grab work very well in Bangkok. They are not liked by the other taxi drivers and no one knows how long they will survive in Thailand, but for now, they really make it easy to move around the city. Legendary motorbike taxis are everywhere in Bangkok. They speed through the city and are beloved by the locals. It is probably the fastest way to get from one point to another. Drivers wear orange vests and that’s how you will recognize them. They usually stand by BTS and MRT stations. 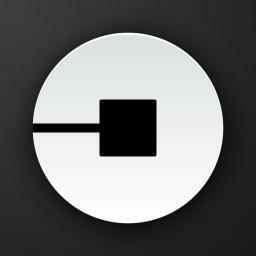 The cost of a ride depends on a distance and you can always try to bargain a little. 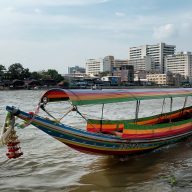 Taxi boats in Bangkok are one of their kind. Thanks to them you can get from one end of the city to the other without any problems. Another advantage is the price. There are a couple of types of boats. Express boats stop at main stations. If you want to cross the river then you can catch a small ferry for only 3 Baht. Riverboats stop in many places and cost from 10 Baht, depending on the length of the journey. Chao Phraya Boat Company has the largest amount of boats and lines. If you are in a rush and are not sure where to stop, then you can use the tourist boats, which stop wherever you like. The price is higher and a trip can cost you even 100 Baht. 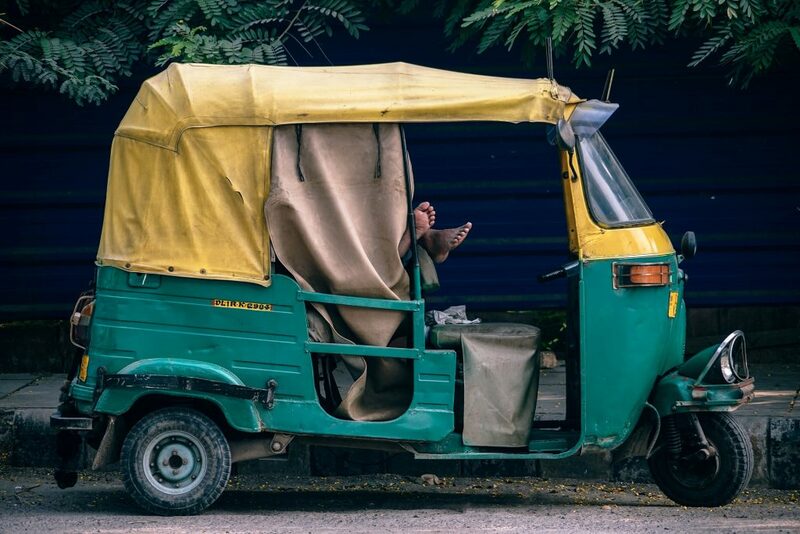 Tuk-tuks are the most famous type of transportation in Bangkok and in Thailand. They are used mainly by tourists, but sometimes locals and expats use them, too. They are a bit expensive comparing to MRT, BTS, or normal taxis. Drivers like to lift the prices when they see a lost westerner. If you want to live in Bangkok, avoid them and choose something cheaper. Chiang Mai is much smaller than Bangkok. People here live slower, but the city is rapidly developing. There are more cars, more scooters and more people, which makes moving around a bit difficult. If you want to live in Chiang Mai, then it’s good to familiarise yourself with public transport here, which isn’t as developed and convenient as it is in Bangkok. They are the only proper public transportation here. 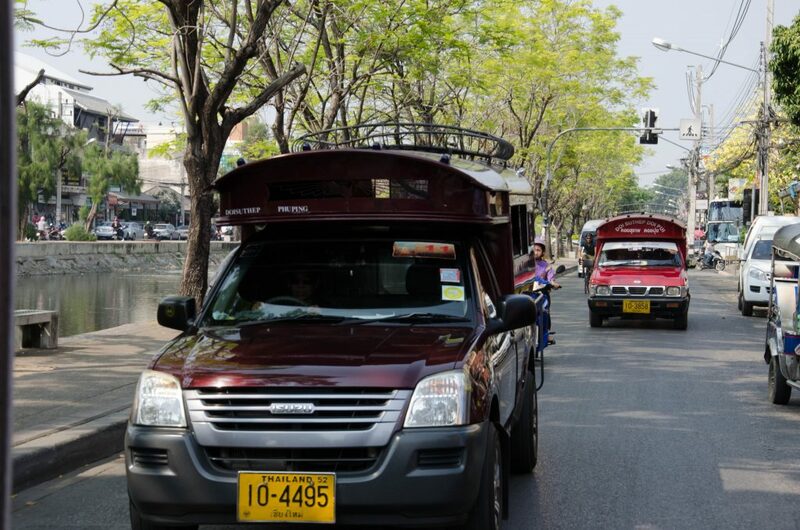 Songthaews in Chiang Mai are also known as the red taxis. They are simply big trucks, made so you can sit at the back on a special bench. One drive costs 20 Baht and if you go somewhere a little further, then you have to pay more. Songthaews in Chiang Mai are very common and you can catch one on a street. They also drive to the nearby towns. Remember that different colours mean different directions and if you want a ride inside the city, then you need to take the red car. A songthaew is a big truck. Passengers sit at the back. This is another way of moving around Chiang Mai. Drivers are available 24/7. Prices are high and you have to bargain to get a fair deal. Tuk-tuks are used mainly by tourists. You can catch a taxi on a street. However, they are not as common. 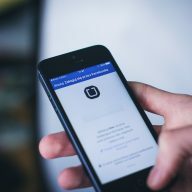 The best way is to use Uber or Grab. The islands in Thailand don’t have buses nor trains. They don’t need them. Most of the islands are small and the locals move around by scooters. If you are not brave enough then you can use songthaews, which are a bit more expensive than in Chiang Mai. For one trip you will pay 50-100 Baht. Sometimes the cost can be spread among the passengers if you hire the car with a few other people. Songthaews are available on the streets of the major towns and you can catch them on the road, too. It’s easy to get from one city to another in Thailand. The country has a very well developed transportation system. Thailand has a few local airlines, which fly to almost anywhere. Additionally, there are foreign airlines and low-cost airlines, such as Air Asia. Tickets can be bought online. I always use Skyscanner or Momondo. There is a good network of buses and trains in Thailand. Those running between major cities are quite comfortable. I recommend booking your ticket on 12GoAsia, which is really great for planning your trips. Buses to smaller towns and villages are less luxurious and travelling on them is a real adventure. You cannot book tickets online and you have to buy them at a bus station. You need to find the right cash desk, which sells tickets to where you want to go. Sales assistants speak some English and it’s not really that difficult to communicate with them. This is an entirely separate subject. If you want to be independent and have an adventure, I really recommend this type of transport. At the beginning, it will seem very difficult and chaotic, but driving a scooter in Thailand is great once you get used to it. Scooters are the best transport in Thailand. You can buy or rent a scooter. Rental places are available in larger cities and one day costs 250 Baht. Buying a scooter involves some formalities and it’s not very hard. 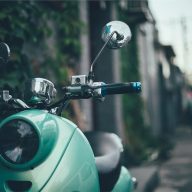 You can read my previous post about how to ride a scooter in Chiang Mai. Thailand is a very tourist friendly country and as a traveller, or an expat, you shouldn’t have any problems with moving around. My advice is not to stress when a bus doesn’t come on time, or if a taxi driver tries to cheat you. Transport in Thailand might not be the best, but using it in an effective way is just a matter of getting used to it.